Los Angeles, California (October 25, 2018) – Intelity, the leading integrated mobile and in-room technology provider for the global travel industry, has announced its full guest service platform is now live at the luxurious Conrad Indianapolis hotel. The award-winning hotel, located just a three-minute covered walk from the downtown Indianapolis Convention Center, launched the Intelity Guest Service Platform, which includes in-room tablets, and Intelity’s staff-facing service management system along with Conrad Concierge through the Hilton Honors mobile app. 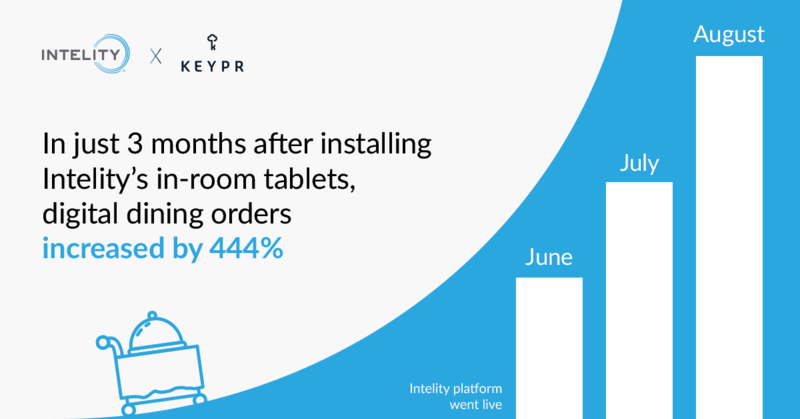 Intelity’s in-room tablets were introduced in June of this year, and the results have been incredible. The property’s goal was to provide a simple way for guests to interact with dining menus, facilitate ordering, and in turn, increase revenue while still maintaining staff performance and capacity. In just three months, digital dining orders increased by an astonishing 444 percent, a clear indication that guests are responding well to the tablets. In addition to the increased orders, the Conrad Indianapolis has also experienced an average in-room dining check increase of almost 15 percent.